Archimedes is universally acknowledged to be the greatest of ancient mathematicians. He studied at Euclid’s school (probably after Euclid’s death), but his work far surpassed the works of Euclid. His achievements are particularly impressive given the lack of good mathematical notation in his day. His proofs are noted not only for brilliance but for unequalled clarity, with a modern biographer (Heath) describing Archimedes’ treatises as “without exception monuments of mathematical exposition … so impressive in their perfection as to create a feeling akin to awe in the mind of the reader.” Archimedes made advances in number theory, algebra, and analysis, but is most renowned for his many theorems of plane and solid geometry. He was first to prove Heron’s formula for the area of a triangle. His excellent approximation to √3 indicates that he’d partially anticipated the method of continued fractions. He found a method to trisect an arbitrary angle (using a markable straightedge — the construction is impossible using strictly Platonic rules). Although it doesn’t survive in his writings, Pappus reports that he discovered theArchimedean solids. One of his most remarkable and famous geometric results was determining the area of a parabolic section, for which he offered two independent proofs, one using his Principle of the Lever, the other using a geometric series. Archimedes anticipated integral calculus, most notably by determining the centers of mass of hemisphere and cylindrical wedge, and the volume of two cylinders’ intersection. Although Archimedes made little use of differential calculus, Chasles credits him (along with Kepler, Cavalieri, and Fermat) as one of the four who developed calculus before Newton and Leibniz. He was similar to Newton in that he used his (non-rigorous) calculus to discover results, but then devised rigorous geometric proofs for publication. His original achievements in physics include the principles of leverage, the first law of hydrostatics, and inventions like the compound pulley, the hydraulic screw, and war machines. His books include Floating Bodies, Spirals, The Sand Reckoner, Measurement of the Circle, and Sphere and Cylinder. He developed the Stomachion puzzle (and solved a difficult enumeration problem involving it). Archimedes proved that the volume of a sphere is two-thirds the volume of a circumscribing cylinder. He requested that a representation of such a sphere and cylinder be inscribed on his tomb. In the 20th century, modern technology led to the discovery of new writings by Archimedes, hitherto hidden on a palimpsest, including a note that implies an understanding of the distinction between countable and uncountable infinities (a distinction which wasn’t resolved until Georg Cantor, who lived 2300 years after the time of Archimedes). Although Newton may have been the most important mathematician, and Gauss the greatest theorem prover, it is widely accepted that Archimedes was the greatest genius who ever lived. Yet, Hart omits him altogether from his list of Most Influential Persons: Archimedes was simply too far ahead of his time to have great historical significance. Obviously, geometry has become a vital aspect to the existence of humanity fro the time immemorial. In the day of old, geometry was the yardstick applied to estimate and survey land. As far as human existence, a lot of professionals have suggested ideals and put forward a set of principles, meanwhile Euclid of Alexandria was nicknamed as the father of geometry because of his popular book. The elements “Majorly, the book combine all the past lectures of the renowned mathematicians such as Pythagoras, Hippocratus and many more Great thinkers. Also included in this book are some other Euclid’s own discoveries. As if that is not enough, the said book is particularly attached with high importance in the library of science books ever is the consistency and systematic logic that the findings have been presented. Born within the range of 325 B.C in Greece and died around 265 B.C. 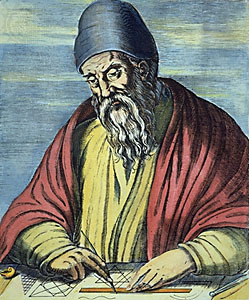 Euclid most likely came from affluent family because it was widely known that he actually enrolled and finished from the school of Plato in the old Greece. Following his education, he got teaching appointment in Alexandria, Egypt. He was in there when he wrote his popular book “The elements”. There is no enough fact regarding thelife of Euclid simply because of inadequate facts at the time and also Euclid was a general name at the period. To buttress this fact Euclid of Alexandria is usually mistaken or confused as Euclid of Megara, another Socratic philosopher. His book “The elements” is what really distinguished Euclid from the rest. Euclidean Geometry is the content of the book and is very useful in the elementary and middle class. Apart from the Holy Bible, the Elements is the largest reading book across the world. The book is the combination of over 400 ideas and opinions arranged in 13 series. To study plane geometry just go for series 1 to 6 whereas number based on the categories of irrational number. Finally solid geometry is reserved for series 11to 13. The Elements is spread across different parts of Algebra, trigonometry and further mathematics. Euclid concentrated his geometry on some ideas and opinion as well as discovering some more other theorems regarding these. This book starts with 5 ideas, the number of which mentions that where there are 2 points; a straight line can be drawn across them. the book in question is first publication was 15thcentury and the sales till date is in millions of copies until 1901, it was an integral part of the school syllabus and even the geometry that was introduced after it still used the principle of Euclid. It has been discovered by the latest researcher that the 5th postulate declares that just a single line passing through a point and parallel to another line. This was refuted by the 19th century mathematician and that the line could be one or more passing through a point and parallel to a given line. All these flaws put together led to the publication of non-Euclidean geometry. Some other works of Euclid are data, division of figures phenomena Euclid, and optics. The lost works include purisms, surface loci, pseudaria and conics. Without doubt, the works of Euclid form as foundation to development of the latest geometry and mathematics.